Whenever a fight goes to the scorecards it seems controversy ensues. This is especially true with the two last big boxing matches: Triple G vs Jacobs and Kovolev vs Ward. Many people felt very strongly that their favortite fighter won. How does one ascertain who won a fight? What is the criteria? How do you break ties when a fight is close? In this article, I want to go through the basics and give a simple methodology to judge fights. Boxing is done on a 10 points must system. The fighter who wins a round scores a 10 and the losing fighter gets a 9. If the round is even, both fighters can be given a 10. If there is a knockdown the fallen fighter recieves a score of 8, and if knocked down twice is given a score of 7 and 6 respectively. A 6 is the lowest score a fighter can receive in any round! What do you to if in round 1 fighter A dominates fighter B. It is a clear win for fighter A and then in round 2 fighter B makes a nice comeback and the 2nd round is very close? If you give it to fighter B the fight is now even but yet objectively fighter A is clearly winning the fight because he dominated fighter B in round 1. Fight fans can see the problem here. In my opinion boxing pundits would do well to call more rounds even. Two perfect examples of this are the Triple G vs Danny Jacobs and the Kovolev vs Andre Ward fight. Many rounds were clearly won by Kovolev and Triple but the underdog fighter (Jacobs and Ward) made several rounds close. Many fans of Danny Jacobs and Andre Ward elected to give these close rounds to their favorite fighters irrespective of the fact that the clear dominant rounds were won by Triple G and Kovolev! Shouldn’t a clearly dominated round count more than a razor thin close round? Why don’t people score more rounds even in such cases? This, in my opinion, is the problem with boxing scores by fan boys who wish to give close rounds to their favorite fighters. 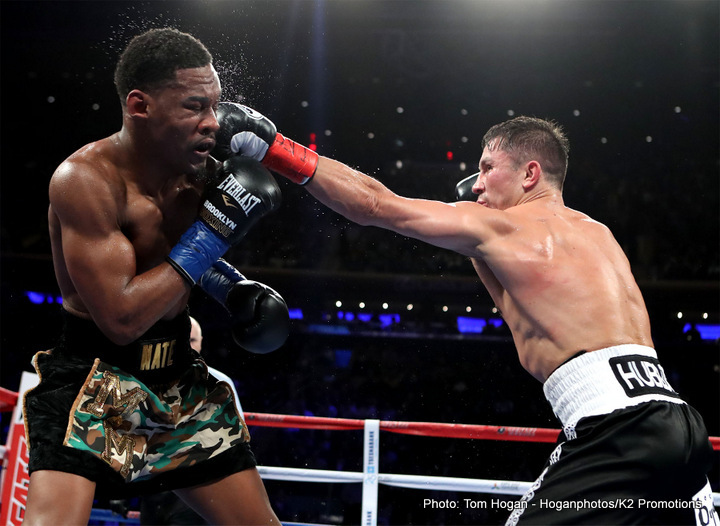 Look at Triple G vs Danny Jacobs…Harold Ledderman gave the first two rounds to Danny Jacobs? Triple G landed more punches and threw more punches. He had Jacobs head snapping back and was chasing Danny the entire first two rounds. Also, any punches thrown by Jacobs were nice flurries, but many punches that were thrown missed or landed more like slaps than actual punches. Furthermore, Danny Jacobs never once hurt Triple G but Triple G CLEARLY hurt Danny Jacobs because he made his head snap back so nicely! Look at the fight between Kovolev and Ward…there were many rounds that were super close buy Kovolev had rounds where he clearly won. Wards fans seemed hell bent on giving any close rounds to Andre Ward. Round 1 was easy to score because Andre Ward was send reeling backwards by a thudding jab that landed cleanly and effectively. Round two was clear for Kovolev too..he was the aggressor and was clearly the ring general that round. Round 3 was close and I felt could have gone to either Ward or to Kovolev. Round 4 was easy to score 10-8 because Kovolev scored a knockdown. It may have been a knockout had he landed cleanly with the knuckles. The right hand shot didn’t land properly and may have cost Kovolev the win. After the first 4 rounds there were a slew of rounds that were very close. These rounds could go either way . I felt Ward won more of these rounds but Kovolev won that fight easily and convincingly because his rounds were the more decisive rounds. Also, even throughtout the rest of the fight he had Ward reeling with good hard shots. There was always a feeling that Kovolev could end things with one big shot whereas for Ward his only hope was stealing rounds and edging out a close decision. The result of this fight was clear bias for the American fighter. Heck, boxing commentators and pudits even allowed the American fighter to get away with head butts, tackles, and excessive holding. It was honestly one of the worse decisions I”ve seen in boxing! Luckily we didn’t get a bad decision in Triple G vs Jacobs but we almost did. Why? Because fan boys and boxing neophytes elected to give close rounds to a clearly outclassed fighter. Triple G gave away atleast 10 pounds yet still had this kid backing up with the jab..Triple G clearly landed the harder more thudding punches and was the fighter doing all the hurting in the fight. Danny Jacobs should be applauded for his valor but he clearly didn’t do enough to win this fight. I feel most of this bad decision making in boxing is a result of bias and just plain lack of knowledge! So, how do we rectify this? First, we need to make close rounds 10-10. This way clearly dominant rounds hold more weight. Second, we need we need to make use of play back. To get a fair score, the judges should be allowed to look at replays to ascertain who landed what. This way fighters get credit for the more suble shots. Boxing is tough, lets not make it tougher for them by allowing judges to see things blindly. We need to make use of the fact that we have different camer angles, slow motion, and other technologies that can make fights more fair and decisions more accurate!